COMBINE the biscuit crumbs, cinnamon and butter then press into the base of a greased and lined 28cm x 18cm slice pan. Chill until firm. BEAT the PHILLY and sugar with an electric mixer until smooth. Stir in the gelatine and peanut butter then fold through the cream. Pour the mixture into the prepared base and refrigerate for 2-3 hours until set. COMBINE the sugar and water in a saucepan and stir over a medium high heat until sugar has dissolved. Continue cooking, without stirring until deep golden. Carefully add cream and stir until smooth then stir through the extra peanut butter. Cool. 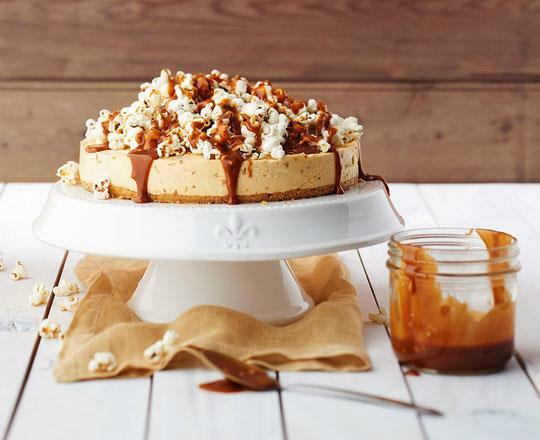 TOP the cheesecake with the popcorn then drizzle over the sauce. Serve immediately.